Alfred Angelo has recently released its latest collection of wedding dresses for their Disney Fairy Tale Wedding series! Since I shared with you all the other dresses, it's about time to share with you the latest collection for the series! My Opinion: I think this dress captures Cinderella's beauty and elegance perfectly in a really simple way. Description: "This modern, charmeuse, mermaid gown is as soft and fluid as the sea. Its draped and fitted bodice features an extravagant belt, gleaming with a treasure trove of crystals, pearls and other gemstones." My Opinion: This is a kind of classy and different take on an Ariel wedding dress compared to the past versions. Not sure if I really like the belt/sash all that much, but maybe I would if I saw it in a different color? My Opinion: I'm not quite sure the connection between this dress design and Aurora's gown, but I think it's pretty. Not really my personal favorite, but it's still beautiful. Description: "Timeless, tulle ball gown accented at the waist with a fairy tale corsage of delicately beaded apple blossoms. This gown is as enchanting as a magical forest!" Colors: Ivory/Tea Rose, White/Tea Rose. Also available in Ivory or White with matching sash. My Opinion: This dress is definitely my favorite out of this set! I think it's simple yet completely beautiful. I love the sheer train in the back and the cute waistband! I'd even consider this one for my own wedding! What do you think of the new dresses? 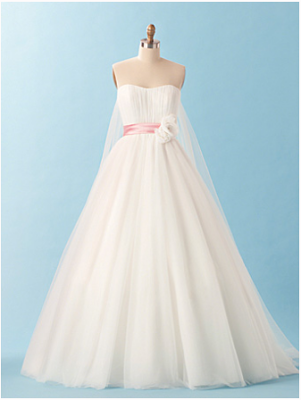 You can see the rest of Alfred Angelo's styles and gorgeous gowns here!